Recovering from any injury can be a difficult and painful process, but auto injuries can be some of the worst injuries during recovery. Because of the mental and physical trauma of an auto accident, the lasting effects can be severe, with injuries and residual tension lasting for months, even years, afterward. While medical doctors would be quick to proscribe pain relief medication, anti-inflammatories, muscle relaxers, and even recommend surgery, you should consider the benefits of natural pain relief, and injury treatment methods such as chiropractic care and massage therapy, before making any decisions about invasive surgeries or medications you’ll have to take daily until your pain goes away – if it goes away. Chiropractic care has the benefits of being a versatile, simple, and effective means of injury treatment, and chiropractic auto injury treatment is becoming more popular and widely recognized every day. As chiropractic care is an insurance-approved means of auto injury treatment, chiropractic is an insurance-approved treatment option for drivers in Minnesota, a no-fault state where your insurance will cover you for your chiropractic auto injury treatment. With spinal adjustments intended to realign your vertebrae and extremity adjustments to help relieve tension in areas of your body that were traumatized and injured in your accident, you’ll be sure to be living pain-free once our chiropractors have seen the extent of your auto injuries and developed a treatment plan. Chiropractic care now often includes massage therapy in treatment plans, as it has several benefits related to muscle tension relief, improved circulation, and reducing inflammation. Our massage therapists specialize in administering a variety of massages, all with different approaches to pain relief and releasing tension. With deep and soft tissue, trigger point, and Swedish massages, we can add a more relaxing treatment solution to your chiropractic auto injury treatment plan so that your body can stay relaxed and free of tension while you’re trying to heal. One of the most common auto injury accidents is known as whiplash, an injury that can be sustained at any time. Whiplash is especially prevalent in auto injury patients simply because of the way that whiplash occurs. During an auto accident, your body is moving forward at the speed of your vehicle, so when you stop suddenly, your vehicle stops moving, but you don’t. That means that while your body is restrained by your seatbelt to keep you from flying forward during an auto accident, your head is still able to move freely, often away from your body. Whiplash is caused when your head and neck are thrown quickly away from your body, straining your neck, shoulders, and upper and lower back. When this happens, you’ll likely feel a surge of pain and then a release, which could leave you thinking that you’re perfectly fine. However, if you’re sustained a whiplash injury, you should seek immediate chiropractic treatment. Whiplash can cause a plethora of negative side effects, which are not limited only to neck pain, though that is one of the most common symptoms of whiplash. You could be experiencing pain to varying degrees, including shooting pains, stabbing pains, aching, throbbing, and even numbness. All of these feelings could be spread out through your upper body, affecting as little as the base of your neck and as much as your lower and upper back, shoulders, and arms. In extreme cases of whiplash, where a nerve is pinched or your vertebrae are misaligned, chiropractic care and massage therapy are the only auto accident treatments that will help return normal circulation, release nerve tension, realign your vertebrae, and help you heal completely. If you’re not sure that you have whiplash, don’t wait to get checked out and let your injury progress; symptoms can lie dormant for months without you realizing that the slight daily neck pain you have was caused by an auto injury that went untreated. 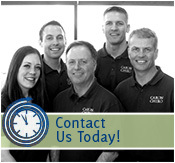 If you’re in need of auto injury treatment for whiplash or any other injury or symptoms, contact Caron Chiropractic immediately to set up an appointment. Call us at 651-255-9999 to find out your auto injury treatment options and begin your chiropractic care and massage therapy auto injury treatment plan.